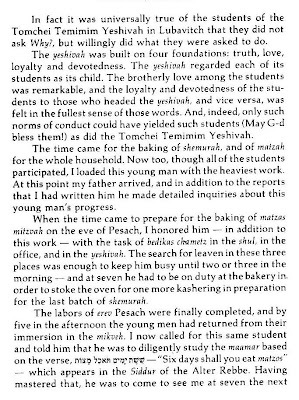 Minyoneh deyomah and in continuation of our portrayal of Reb Avrohom Elyeh Plotkin Zatz"l, the following is an extract from a Sicha of the Friedike Rebbe, the sixth Lubavitcher Rebbe and, in his fathers lifetime, the Menahel poi'el of Yeshivas Toimchei Temimim. The Sicha is printed in Likkutai Dibburim vol 1 (translated by Uri Kaploun and published by Sichos in English [volumes 4 and 5 are available here and here], the original Yiddish edition is available here) as the Sicha of חג הפסח , תרצ"ד (1934) - חלק א. 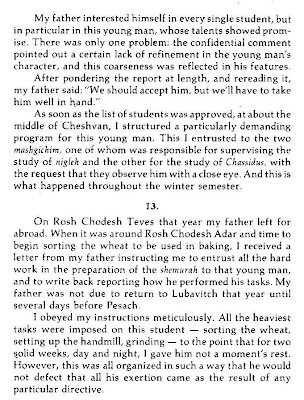 The Sicha begins with a description of the preparations for Pesach in Lubavitch and ends with a personal account of the harsh regime that he (under instruction from his father, the Rashab) imposed on a certain student, tasking him with the hardest roles in the preparations for Pesach. 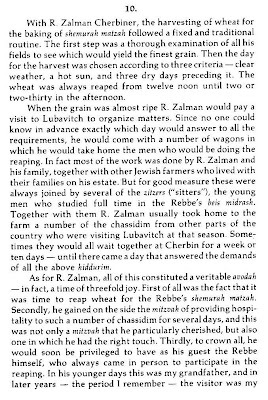 This student, though left unnamed in this account, is known to have been none other than Reb Avrohom Elyeh Plotkin Zatz"l.
Although “Not Brisk” has ended his career as a blog host (see here), he still lives on in spirit and his presence continues to inspire the blogosphere. This post is dedicated in memory of his dear departed blog. You wrote nothing about him except that he was "great". The actual description can fit myriads of others. I am not any wiser than I was before reading this. When I asked him how that made him different from hundreds of others like him he began to get defensive and turned his attention to me. He had reached the pinnacle of hasboroh and was rendered speechless by an amateur like myself. I am, however, willing to give Not Brisk the benefit of the doubt. (I dare not suggest that he may not only be lacking in hasboreh but also in havoneh.) I therefore take myself to task for not immediately making clear Reb Avrohom Elyeh Zatzl”s distinction and will, having recognized my fault, make good my oversight. 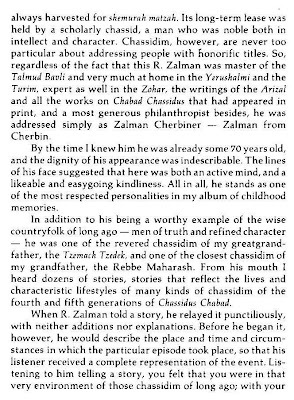 1) Despite having already formed strong opinions and developed a solid world view, Reb Avrohom Elyeh, nevertheless had the confidence and breadth of mind to explore and even embrace the new path of Chassidus when he encountered it. 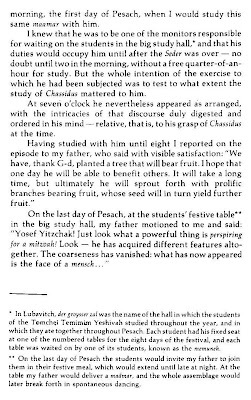 This, despite the complete reversal of his previous perspectives, the tremendous intellectual effort required and the rigorous schedule set out for him by the Menahel of the Yeshiva [an episode that will be addressed בעז"ה in the next post]. This, despite the necessity to throw aside the self interest that is almost inherent in human nature. The entire narrative strongly portrays Reb Avrohom Elyeh’s strength of mind and will, as well as his unique commitment to the pursuit of truth even at the expense of personal comfort. The fact that even his facial features became more aidel, is testimony to the extent that he managed to overcome the natural grobkiet of the physical body and human mindset, transforming himself into a different type of being – a yid who radiated Avodas HaShem. 2) The type of bitul described above is not usually associated with the type of personality described by Reb Berel Rivkin. 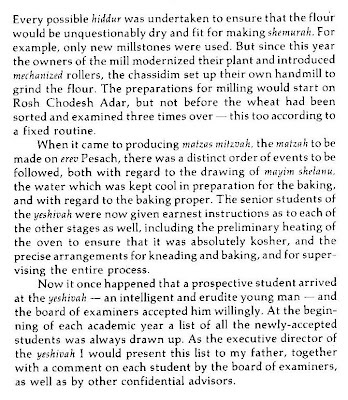 The rigorous use of one’s intellect to properly understand and be mechadesh, fathoming the depths of the most difficult sugyes in Shas, requires that one recognize one’s own merits and abilities. This is seemingly contrary to the principles of bitul in which Reb Avrohom Elyeh so excelled, which require that he put aside his own logical conclusions, subjugating himself to an entirely new discipline, whose most basic principles flew in the face of predetermined conceptions. 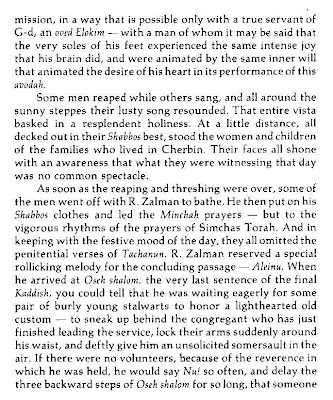 Similarly, the description of Reb Avrohom Elyeh as someone who indulged in casual conversation, even of the sort of which the Gemorah says "שיחת חולין של תלמידי חכמים צריכים לימוד", seems slightly incongruous with the extraordinary bitul and dedication to Avodas Hashem described above. 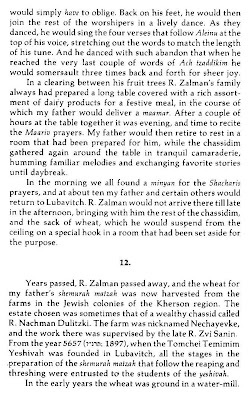 Reb Berel Rivkin’s recollections of an individual who he obviously knew intimately, offer great insight into the uniquely complex personality of Reb Avrohom Elyeh. 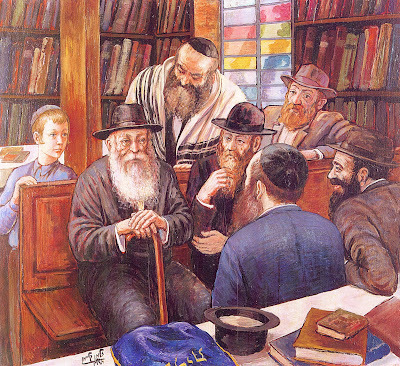 We are allowed a glimpse of a multifaceted character who encompassed and combined a complete range of desirable traits in a manner that can only be achieved and only understood according to the principles of Chabad Chassidus. 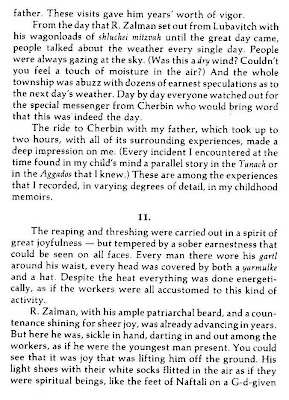 Certainly, the descriptions of Reb Avrohom Elyeh, published in previous posts themselves belong to the category of שיחת חולין של תלמידי חכמים צריכים לימוד, ויש להאריך עוד בכל הנ"ל, ועוד חזון למועד.